Mom and I have been quite busy these days. Between work, school, and various health issues, we haven't been able to find the time to grab a meal in weeks! Fortunately, we've managed to get back on track. Since we were on the go early in the morning (well, early for us), we decided to have breakfast at one of our favorite places - Joe's Family Restaurant. We pulled into the parking area at about 12 p.m. 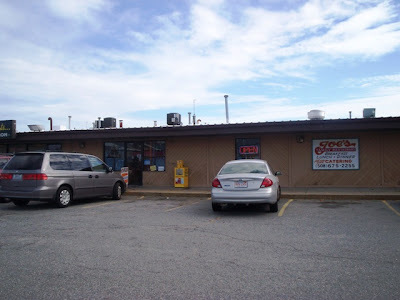 Located in a small plaza, Joe's is quite popular with local folks. Although the restaurant seems small from the outside, it is actually quite long and can seat quite a few people. Aside from the dining area, there is a large counter with stools for those people who may be eating alone and don't want to hog a whole table to themselves. 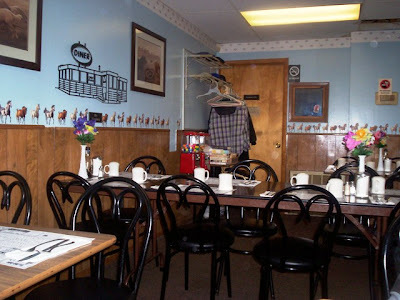 The restaurant is painted a light blue and decorated with horse decals along the wooden chair rail. There are also several framed photos of horses hanging on the walls. The owner must be quite the equestrian! Joe's is definitely not a "cloth napkin establishment", but it is definitely a cozy, clean place to eat. Mom and I have always enjoyed eating at Joe's. When we walked through the door, Mom and I chose a secluded seat near the curtained window. One of the great things about coming to Joe's is that you get to seat yourself. A friendly waitress - who we later found out was named Kelly - came over to take our drink order and deliver two plastic-covered menus. Mom ordered the bottomless cup of hot coffee ($1.45) while I chose a large glass of iced ($1.85). Kelly quickly filled the cup that was closest to Mom, and went off to the kitchen to grab my beverage. When Kelly returned, I asked her for some Sweet 'N Low, which she had been carrying in her apron. Perhaps they've had some Sweet 'N Low thieves lately? I wonder why the packets were so guarded? Since we already knew what we wanted, Mom and I placed our order. 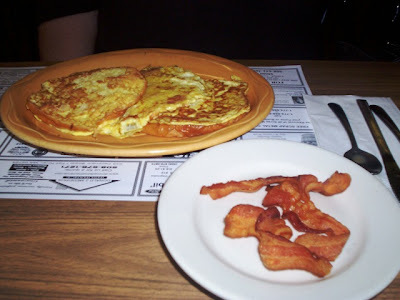 Mom chose the sweet bread French toast ($4.15) with a side of bacon ($2.65), while I went with the Fall River omelet ($5.95). I remembered that when I ordered this dish on our last visit, the waitress had asked me if I wanted it regular or spicy. I told Kelly that, if I had a choice, I would want it spicy. She smiled and told me that they would make it any way I wanted. My meal came with toast and home fries, and I picked rye from the many kinds of breads available. Kelly took away our menus and disappeared into the kitchen. Mom and I first started eating at Joe's when my sister was in the summer music program at the nearby middle school. This was back in our bus-hopping days, so needless to say we did a lot of waiting back then. Since we had nothing to do, we decided to tour the area. We came upon Joe's and decided to go in. Mom didn't have much money on hand, and I hadn't even started working yet (ahh ... the good ol' days). Luckily for us, there was one item on the menu that we could afford - the grilled cheese danish. Paired with a cup of coffee (and a soda or strawberry Yoo-Hoo for me), this was a perfect low-cost breakfast, and it was absolutely delicious. 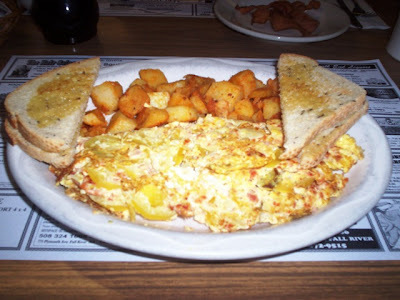 Joe's has a variety of low-cost breakfast options such as omelets, pancakes, waffles, pastries, egg dishes, bagels, toast, and breakfast meats. Unfortunately the pictures that I had taken of the menu didn't come out very clear, but I can tell you that there was not one item on the breakfast menu that was over $8 (that I could spot, anyway). 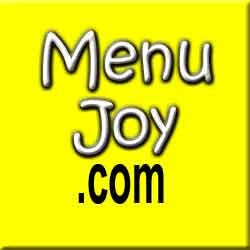 Although I did not see a lunch or dinner menu, I'm assuming that they feature some comfort and local food favorites. When our breakfast arrived (brought over by another waitress), both plates looked great. Mom's plate came with three big slices of Portuguese sweet bread, which were perfectly cooked and served nice and hot. Topped with syrup and butter, it made for a delicious meal. The side of bacon came thick and meaty, and was also perfectly cooked. Mom said that this side dish was a great addition to her French toast, and she would definitely get it again. My omelet was SPICY. Mom even commented on my shiny, pink face because I was "glowing" - like a pig. The omelet was chock full of chourico, onions, and banana peppers. It was served dry (which I love because I can't stand wet eggs). The home fries and toast were delicious as well. Actually, the home fries and toast were what kept me from chugging my entire iced coffee after the first bite of my omelet. I kept taking small bites of the sides to muffle the spice, but I wouldn't have it any other way. I love this dish! I took the bill up to the cashier and told her that the bill was "all set." I had given her a $20 bill, which included a 20% tip for Kelly. She was a great waitress. Come to think of it, we've always had great service at Joe's. That's why they have such a loyal customer base, and also why Mom and I have been eating here for years. Believe it or not, Mom and I have never eaten lunch at Joe's, but we have heard great things about their burgers and fries. Perhaps one of these days I'll have to skip work and drive on over to Joe's and have lunch. I'm almost certain that we won't be disappointed. Hmm ... I suddenly feel a cold coming on ... *cough, cough*. Could a sick day be far behind? 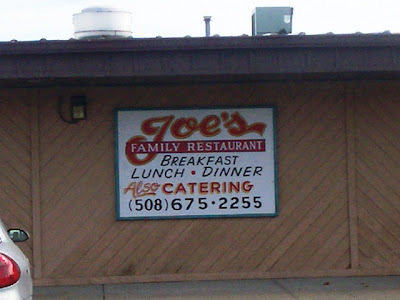 Joe's Family Restaurant is open from 5 a.m. to 3 p.m. Monday through Wednesday (for breakfast and lunch), 5 a.m. to 8 p.m. (breakfast, lunch, and dinner), 5 a.m. to 3 p.m. on Saturday (breakfast, lunch, and dinner), and 5 a.m. to 1 p.m. on Sunday (breakfast only). Joe's is closed on Tuesday.